Two Chinese astronautsspent five days in orbit last month on the country's second manned space mission. Thegovernment has said the next mission could be launched as earlyas 2007. News reports Thursday saidthe 14 candidates for the next mission include Yang Liwei, Fei Junlong and NieHaisheng - the three men who flew aboard China's first two manned spacemissions, Shenzhou 5 and Shenzhou 6. A report in the BeijingMorning Post said that after Shenzhou 7, China would send two unmanned vehiclesinto space with equipment to set up a space station. It is expected to take 61/2 years to develop rockets powerful enough to launch the necessary equipment,the paper said, citing Liu Zhusheng, chief designer of China's Long Marchrocket. 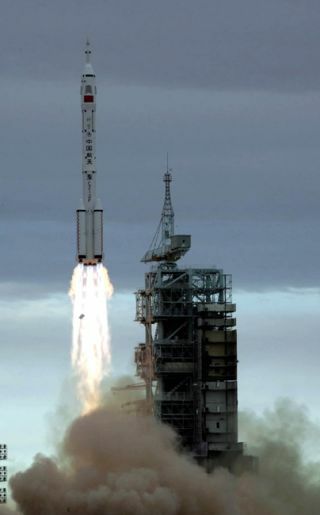 China launched its first mannedspace mission in 2003, making it the third country to send a human intoorbit on its own, after Russia and the United States. A second, longer missioncarrying two astronauts was completed last month.